We are so accustomed to don’t-care companies and government agencies that we have become calloused. We accept lousy customer service in nearly every interaction as the norm and we take it in stride. Problem: Jawbone did great R&D in developing UP. 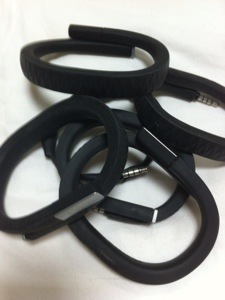 However, whomever actually manufactured the UP bands in Taiwan or China created a disaster for Jawbone. The bands were widely sold in 2011 and early 2012. 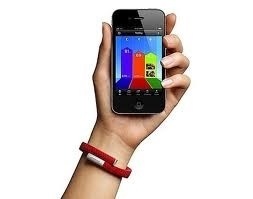 Only after users used and recharged them would a nearly universal failure of the band occur. The problem became so severe at the end of 2011 that Jawbone offered a 100% refund to all UP Band owners, no questions asked. If, as I did, you preferred to hang on and try to stumble on a working band, Jawbone would continue to send you replacement bands – in my case TEN so far, in an attempt to get you a good one that would last. Yes – it’s a hassle that the UP Bands die, but Jawbone’s superb customer support makes it a breeze to get a replacement. A brief online chat with support or completion of a very simple form results in a new UP band winging its way to the owner. Oh, and don’t bother sending the bad one back. They don’t want it. This to me is real customer service. They know there is a manufacturing problem that affect most UP Bands, admit it, and make it a painless as possible for owners to get a new one – while we wait for UP Band version 2 to hit the streets. It’s a very cool product and I hope Jawbone has not soured on the idea of selling a health/fitness band. UP, despite its shortcoming, is a great tool. You might know that might wife, Madge, is in a wheelchair and is unable to use her hands. (She has a blog too. www.wisdomandfaith.com) Madge has a great assistive dog named Tahoe that helps her when she drops things. At the sound of something hitting the floor, Tahoe springs to his feet and comes looking to see what is amiss. He spots the wayward object and gives it back to Madge. Madge has an iPhone and loves it. For anyone with a disability, the iPhone and iPad are great tools. Occasionally, Madge drops her iPhone – ok, a few times per week. If it were not for the Otterbox protecting her phone, it would be it pieces for sure. When her phone hits the floor, Tahoe comes running and scoops it up in his mouth. (Occasionally he runs around the back yard with it, just to show off!) 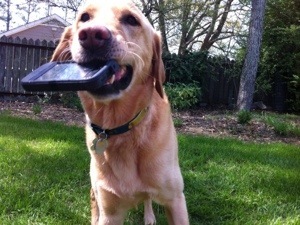 Fine except that Tahoe is a pretty good size golden-lab and the pressure of his teeth and jaw occasionally crack the protective screen that is part of the Otterbox. No problem! A quick call to the Otterbox otters (as they call themselves) and a replacement is on the way pronto! No proof of purchase, serial numbers, etc. Just a quick explanation. Done. That is customer service. By providing great customer service, Jawbone and Otterbox are creating an unpaid virtual sales force. Whenever we get a chance, my wife and I talk about these two companies and the great service they provide. We and many like us are “selling” products for these companies and are happy to do it. It’s just a dream, but maybe one day other companies (and government agencies) will follow the Jawbone and Otterbox examples – and reap the reward that comes when you honor your customers!